Crowdfunding Campaign for Young Creatives – RawFfest 2017 | News by Wales Express News, People Before Profit! A Crowdfunding campaign to support RawFfest has launched. RawFfest is unique because it is ‘created by young people, for young people’. This new youth arts festival, takes place at Venue Cymru and other locations in Llandudno from 17 to 20 August 2017 for 14 to 25 year-olds. Ruth Garnault, Director RawFfest GwylGrai Youth Arts Festival, who has supported the team to put the Crowdfunding campaign together says: “Why would you give your hard-earned cash to a bunch of young people so they can have a great time at a festival? We need help to make sure that price is not a barrier to young people from disadvantaged areas in Wales, to take part in the festival. The RawFfest team are hoping to raise £5,000 during the month of May. The campaing includes rewards, for example a personalised postcard, goodie bag or the opportunity to support a young person to join the Creative Industries team. 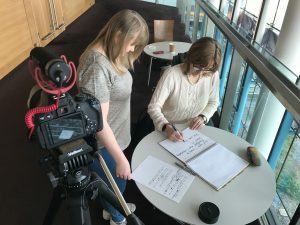 Arron has created a film which explains the festival and the campaign at http://www.crowdfunder.co.uk/rawffest-gwylgrai. The money will be used to support reduced price and free tickets targeted at disadvantaged young people and to nurture the next generation of professional artists. The festival has received financial support from Arts Council of Wales and the Welsh Government. A Festival Weekend Pass is available for £50 at https://venuecymru.co.uk/whats-on/FULL-WEEKEND-PASS/80724/booktickets.html. Accommodation packages start from £15 for the lucky first few purchasers. Day tickets are £20 and £10. For additional information and view the core programme go online to http://www.rawffest.wales/.